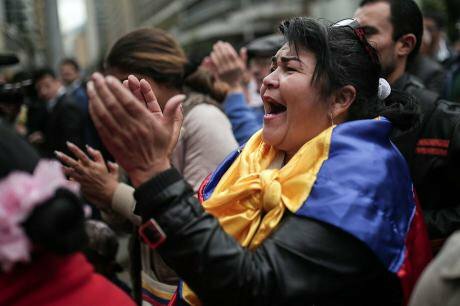 A woman reacts during the broadcast of the handing over of weapons of the Revolutionary Armed Forces of Colombia (FARC) at the municipality of Mesetas, in Bogota, capital of Colombia, on 27 June 2017. Jhon Paz/Xinhua News Agency/PA Images. All rights reserved. It was perhaps tempting to treat the signing of the peace agreement in September 2016 with some euphoria. Certainly, for many in a country having endured 52 years of civil conflict, it was a welcome cognitive shift, and younger generations could imagine a society without the FARC for the first time in their lives. Yet the ‘NO’ result in the plebiscite, and the gruelling renegotiations with the opposition that followed, were a reminder that peace will demand the same level of determination for some years to come. This was not a surprise for the negotiating team, who had already drawn out the implementation process in Agenda Item 6 and were aware of the approaching challenges. “If we doze off for just a second”, urged Lucas Carvajal, member of the FARC-EP and part of the delegation in Havana, “we are not going to transform anything and this whole process will be a total failure”. Only reconciliation, as spoken of by Pope Francis in his recent visit to the country, will heal the fractures in this highly polarized society. There are different opinions, and undoubtedly different motives at play, but there should be only one common objective: a lasting peace. Even if 310 pages of small text were considered to be hardly digestible for the wider public, the final accord maps out an ambitious post-conflict reconstruction project. No single agenda item is free from its challenges. Yet perhaps the greatest challenge of all is comprehensively and simultaneously implementing the 310-page agreement. As the negotiation process taught us, each agenda item is interconnected to several others. For example, it is difficult to talk about political reincorporation (agenda item 2) without getting caught up in issues of transitional justice (agenda item 5). Similarly, how could rural development be achieved (agenda item 1) without addressing illicit drug cultivation and organised crime (agenda item 4)? Such realities transformed the negotiations from a linear item-by-item process into a more complex structure of interconnected decision-making. The implementation process now faces the same challenge, but on a much grander scale. In March 2018, Colombians will go to the polls to elect members of Congress and, by the end of May they will return to the polls to elect a president. Much like the referendum, it is expected to be a highly polarized contest using the peace agreement as a political weapon. Yet in some ways, the outcome is almost beside the point if a depolarising dynamic is not set in place. The agreement will not be fully implemented in four years, or even eight. Stable and long-lasting peace will likely require an ongoing consensus on some key issues within the final agreement. To preserve this consensus, a strong political coalition needs to be built around the agreement, and especially around some of the fundamental issues. This coalition will then need to build an alliance with the incoming president and his successors, whoever it may be, as well as other groups that have opposed aspects of the agreement – this depolarising dynamic is absolutely necessary. This alliance must ensure a strong commitment to, and importantly respect for, the implementation of the agreement. Only such a depolarised coalition can prevent the agreement from being diluted or, worse, eliminated. After decades of armed conflict, the transformation of the FARC-EP into a legal political actor that is fully accepted and integrated in the political life of the country is not something to be taken for granted. This was one of the most difficult topics to discuss at the negotiating table, and will of course be even harder to be fully accepted by the public during transition and implementation. This requires a social reconciliation, one that allows Colombians to say, “I may or may not agree with the idea of the FARC as a political party, but I can still respect it as a legitimate actor in politics and a contributor to a strong democracy”. When a member of the FARC was observing the UN survey of the weapon registry, he was asked by an onlooker, “How do you feel about the process?” The FARC member’s response was both anxious and optimistic. This is because while the final agreement presents a new and positive vision of the future for Colombia, it also leaves behind a significant vacuum. For many, it is not clear what is going to fill the political, social and economic role that the FARC held for so many years. And aside from setting the terms of the FARC’s political reincorporation, its rank-and-file members will also need to undergo their own complicated economic and social reincorporation. The rise in organized crime activity since the signing of the agreement has been fairly well reported, both in Colombia and internationally. Amongst this surge in violence, several FARC members and their families have been victims. Elsewhere, ex-FARC members are being offered thousands of pesos a month to join organized crime groups – which appears likely to perpetuate violence. There is an urgent need for the government to comply with its security guarantee both in the specified zones according to the agreement, and beyond, filling the daunting vacuum left behind by the FARC with opportunity and security. The agenda for rural reform is known as the ‘golden bridge’, because it brought the FARC to the negotiating table. The government was aware that without a planned transformation of Colombia’s rural areas, peace would not be attainable. It is one of the hardest points to implement purely as it requires the biggest commitment from the state and is expected to have a high impact from those in the regions. It also needs a fair amount of private investment. It sometimes looks more like an ambitious state-building project than a post-conflict recovery – but that reflects the depth and breadth of the conflict. There are short-term objectives that can likely be achieved quickly with engagement from communities. However, the government needs to be clearer on what the potential challenges are in this area and how to overcome them. One such challenge is ensuring security in the areas most affected by paramilitary activity, and another is being able to present real, observable rural transformation. The key to this is going to be strengthening local institutional capacity. Involving the private sector, communities, and cooperation agencies will require strong leadership and institutional design. However, there is less ‘fiscal space’ than there was four years ago, in terms of budget distribution flexibility, so there needs to be a real realignment of priorities. Resources cannot continue to be solely focused on urban areas. If peace is the common objective, then all of these challenges have achievable solutions. But public reconciliation doesn’t come without conversation, debate and education. Do you agree with the 5 challenges? What can Colombia do to overcome them? And what practical steps can citizens take towards reconciliation? Please leave your thoughts, or ideas in the comments section below.